"Because if there was one thing Cress knew about heroes, it was that they could not resist a damsel in distress. And she was nothing if not in distress." Pg.29Cress continues this great sci-fi fantasy adventure infusing the tale of Rapunzel within the ongoing stories of Cinderella (Cinder) and Little Red Riding Hood (Scarlet.) This series is by far my favorite fairytale retellings, and Cress did not disappoint as we greet a socially awkward damsel into our hero group that’s set out to stop the evil Queen Levana. The fairytale of Rapunzel was never really high on my favorites list, and therefore I went into Cress not knowing too much about the original tale. I did know the basics, and from what I read, the book incorporated them wonderfully in the book. 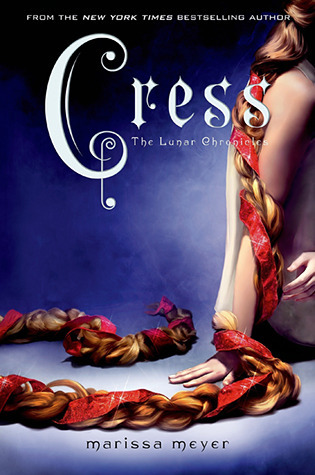 In relation to the previous books of The Lunar Chronicles, Cress does more of a combined plot line. This book more converges characters’ story lines, rather than beginning a new, albeit correlated adventure like what happened in Scarlet. The multiple point of views are a definite benefit in assuring the reader knows what’s going on throughout the galaxy. Cress has constant fantasies about how she imagines life would be outside her prison. They are all she have as friends and all she have to keep her sanity. She uses these fantasies throughout the book as support to give her strength in tough times, but I was glad to see she that she learns to do without, and learns to accept the realities and flaws of people and life. Although at a first glance, Cress seems weak and the very image of a damsel constantly in distress, when known on a deeper level, she’s cunning, smart and a great technological asset to the team. “It wasn’t only loyalty and friendship that made very fiber of her body rebel against the notion that she could abandon them all. Trust is a large theme, and the plot thickens as Cinder must find a strategic way to stop the wedding and protect Emperor Kai. Everyone is putting their trust in Cinder and when Wolf loses faith, he must try to keep his trust in her. Cress must learn to trust her new friends, and vice versa. Other characters that are introduced have their trusts questioned as well. Who will obtain and maintain this trust in Cinder, and who will waver? This book is a must read! Cinder furrowed her brow. 'A revolutionary,' she repeated. In the end, I love how Marissa Meyer plays with our emotions through the suspense of repeatedly breaking up the group, so we can see if and how they try to find each other. It’s a game of fortunes as we continue in the fight for humanity and the Lunar throne in Cress. As we are introduced to Winter, who seems looney but sweet, we are made to crave the next book that much more.